It's fair to say that maintaining blonde hair is no easy task. I've had just about every hair colour imaginable, and while they all come with their challenges blonde has got to be the most difficult. Not only is the lightening process drying and damaging-even if you're extra careful or get it done professionally- but keeping a nice clean colour that's free of regrowth and brassy tones can be time consuming. But for me personally I think it's worth the effort, I feel much more 'myself' with blonde hair and think done right it's a really pretty and striking shade. 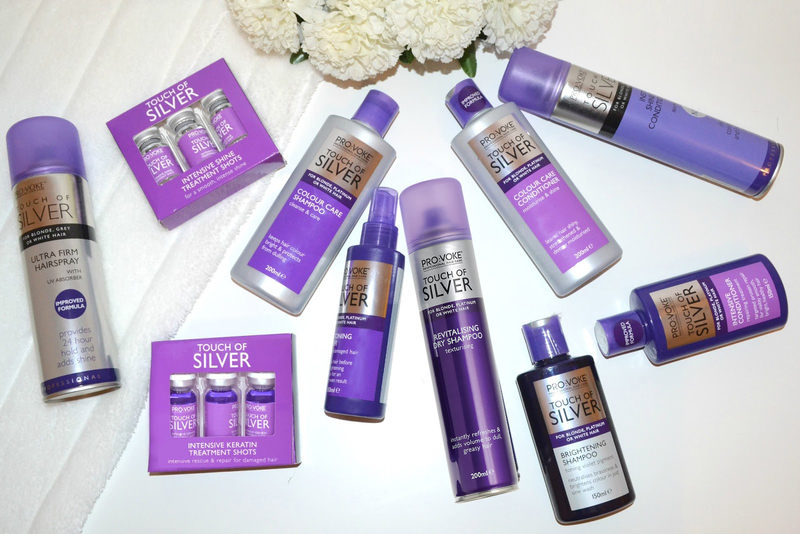 Luckily for us blonde addicts, Touch of Silver have brought inexpensive yet highly effective products to the highstreet that mean maintaining blonde hair is that bit easier. Along with their famous colour correcting shampoo and conditioner there are also some other fantastic products aimed to keep the colour and condition of blonde hair at it's best. Here are some of the products in the range, and what I think of them! If you're looking for a damage-free way correct brassy tones in blonde, white or grey hair this is the best way to go about it. The primer in step one smoothes the hair cuticles while locking in shine, this helps to prepare the hair for the shampoo to give it an even result. You can use the colour correcting shampoo and conditioner without this step, but for the best result (especially if your hair is quite dry or damaged) it's well worth spritzing through with this first. Followed up with their brightening shampoo and intensive conditioner, small amounts of violet pigments are left behind which effectively cancel out unwanted warm tones. Unlike other purple toned shampoo and conditioners these work so well as the colour of the products are a really intense purple colour and leave a good deposit of colour in the hair. I wrote a full review on their colour correcting shampoo and conditioners here if you want to find out more! 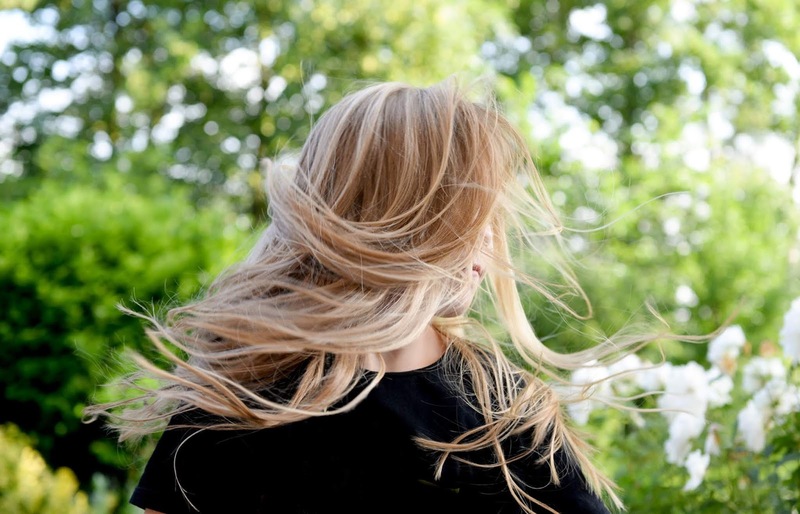 Maintaining the condition of blonde hair is an ongoing battle, once you've gone lighter using bleach anything that promises to hydrate and repair will be your new best friend. I was extremely excited about these 'treatment shots', they're unlike anything I've used before. In a bowl you mix a 'shot' with water which creates a deeply conditioning hair mask, you can adjust this depending on the condition of your hair but for very dry hair it's one shot with an equal amount of water. The mixture itself looks a little underwhelming (and as though there's not going to be enough there to make a difference) but the effects are amazing. After just one use my hair felt noticeably sleeker and smoother, unlike regular treatment masks you obviously don't need to slather your hair in bucket loads of product for it to make a difference. While the Touch of Silver range is designed with blonde, white and grey hair in mind, a product like this can of course be used on any hair colour. Unlike some of the other products in the range, these wont adjust the colour in any way. Perfect for anyone who uses colour, chemicals or heat on their hair or just feels that their hair needs a highly moisturising pick-me-up. Over washing bleached hair is never going to end well- not only does it dry it out even further but top that off with daily blowdrying and it can be a disaster for hair that's already delicate. And so dry shampoo to the rescue- if like me you feel like a greasy mess if you don't wash your hair every other day this means you can stretch it out a little bit further. This one is formulated with a UV absorber to help protect against sun damage and fading, while refreshing and reviving the hair. The 'dry conditioner' is another favourite of mine from this range, I use regular leave in conditioners a lot but with them being a wet formula I find they can weigh down the hair and leave it looking a bit lank between washes. This is really handy for adding moisture to the hair on days that you're not washing it, it's nice and lightweight but still delivers a great moisturising hit. It contains silk proteins to add moisture and shine, and reduces unruly flyaways. Hairspray isn't a product I use often these days as I tend to go for softer and more relaxed styles. However I have given this a go and as far as hairspray goes this is a nice one- it holds well without leaving the hair crispy or sticky. As with the conditioning spray it contains silk proteins to add shine and a UV absorber so is actually good for the hair. How do you keep your bleached or coloured hair in good condition?